With the Hunter Hi-Flow Top Storage Dog Box, you'll see the same unmatched quality construction that comes with the Hunter line of aluminum dog boxes, with the added benefit of 3 separate dog compartments and a top storage compartment. There is plenty of ventilation between the compartments, as well as flow from front to back via the doors and rear vents. The top storage compartment on the Hunter Hi-Flow Top Storage Dog Box is top notch. 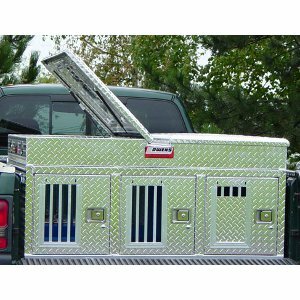 It covers the entire width of the dog box and features dual lids that are accessible from each side of the truck. Another nice benefit to this aluminum dog box is the optional side wheel well notches that allow for compatibility with short bed trucks.